From New York Times best-selling author and popular blogger Stephanie Pearl-McPhee comes a new spin and a hilarious look at life, parenting, and, well, pants. 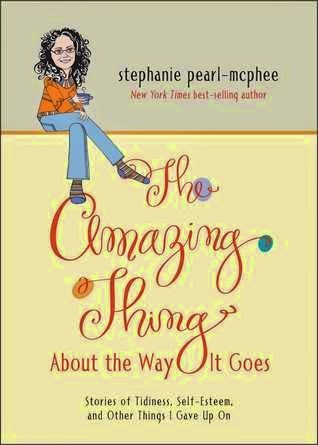 The Amazing Thing About the Way It Goes takes on the amazing in the ordinary in this side-splitting series of short commentaries. Pearl-McPhee turns her trademark wit and perspective to everything from creative discipline to a way you would never think about fixing your email situation. This book looks at everyday problems, and honestly, it won't do much to solve them, but at least you'll be laughing. I picked up knitting needles for the first time about ten years ago. I had just graduated from college, and I decided that knitting sounded like a great and relaxing activity to pick up, because I had made the chilly Northeast my home. I fell in love with the hobby, and I now own way more yarn and knitting books than I know what to do with. I discovered Stephanie Pearl-McPhee’s website early on in my knitting career, and I fell in love with the blog. The blog is devoted to Pearl-McPhee’s life, her knitting, and the funny way knitting and her life collide. Like many big-time bloggers, Pearl-McPhee got a book deal. I picked up all of her books as soon as they came out, because I was guaranteed a good laugh. In the last few years, I haven’t been reading Pearl-McPhee’s website as consistently. This is mainly due to her blog focusing more on her life than on her knitting. The blog is still enjoyable, but it wasn’t pulling me in like it used to. Anyway, I was quite shocked when Amazon recommended Pearl-McPhee’s new book to me a few months ago. How did I not know that she had a new book coming out? Because money was super tight at the time, I immediately asked the library to purchase the book, so I could read it as soon as it came out. I am sad to say that I was quite disappointed with the book when I finally got the chance to read it. Before I start my critique, I need to say that the book is well written and funny. It is just not what I was expecting (or wanted). I didn’t read the book blurb warning me that this book focused more on Pearl-McPhee’s life and less on knitting. I kept moving from short essay to short essay expecting knitting stories and instead reading stories about raising her daughters and other life events. The stories were okay, but they were just not what I wanted to read. Also, Pearl-McPhee and I are in different life stages (she has three grown daughters and I do not have children yet), so I had a hard time connecting with her on some of the stories. I am so sad that I did not enjoy The Amazing Thing about the Way It Goes. I really wanted to like it, but I could not connect with Pearl-McPhee on a consistent basis across the short essays. Also, the stories just did not feel as fun and delightful as her previous books. I appreciate that she is at a point in her life and writing career where she just doesn’t have as many knitting stories to tell as she used to and/or that she wants to write about something else. Unfortunately, I don’t seem to enjoy her non-knitting stories as much. If you have been wanting to read something by Pearl-McPhee, but you are not super interested in knitting, The Amazing Thing about the Way It Goes is the perfect book to pick up. If you are a crafty person and you have been wanting to read something by Pearl-McPhee, I recommend reading Yarn Harlot, which is one of her first books. It is hilarious and more focused on knitting. I hate to do this, but I can only give this book a 2 out of 5. It really only was okay.